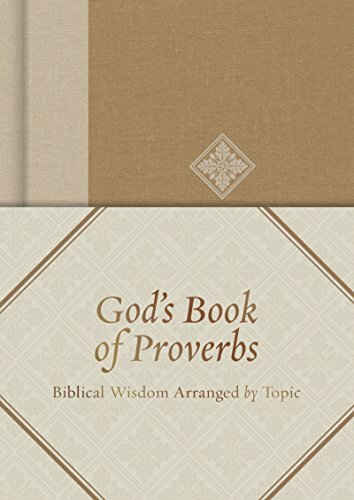 God's Book of Proverbs is the book of Proverbs arranged topically all in one little book which allows the reader quick access to look up and apply the knowledge and insights of the scripture. There is also an article "Connecting Wisdom to Jesus" by Trevin Wax explaining how Jesus is the source where our wisdom comes from. The reader will also find an article on how to read the Proverbs. The scriptures in God's Book of Proverbs is in the Christian Standard text (CSB); which is easy to read and understandable, and stays as literal as possible to the Bible's original meaning. This is my preferred translation. This book would be very useful for those sharing God's word, for writing messages, for Bible study and personal reference. Small and light enough to carry with you where ever you go.